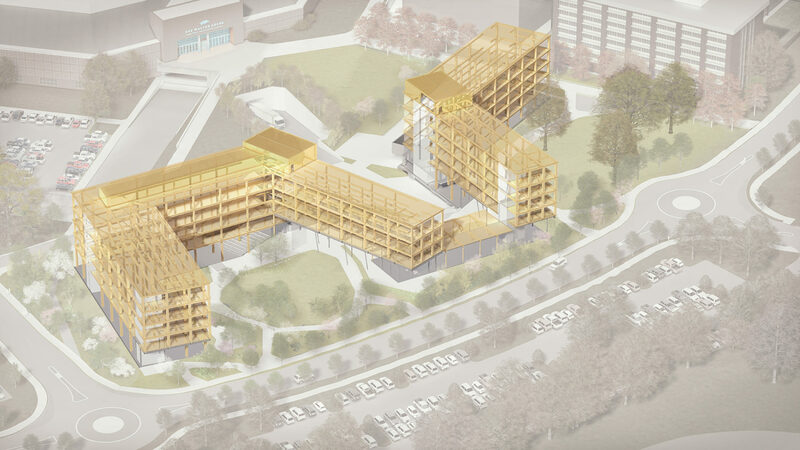 A national design collaboration led by Boston-based Leers Weinzapfel Associates and including Arkansas-based Modus Studio, St. Louis–based Mackey Mitchell Architects, and Philadelphia-based OLIN has created America’s first large-scale, mass timber interactive learning project, already under construction at the University of Arkansas. 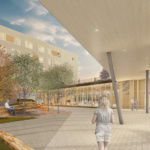 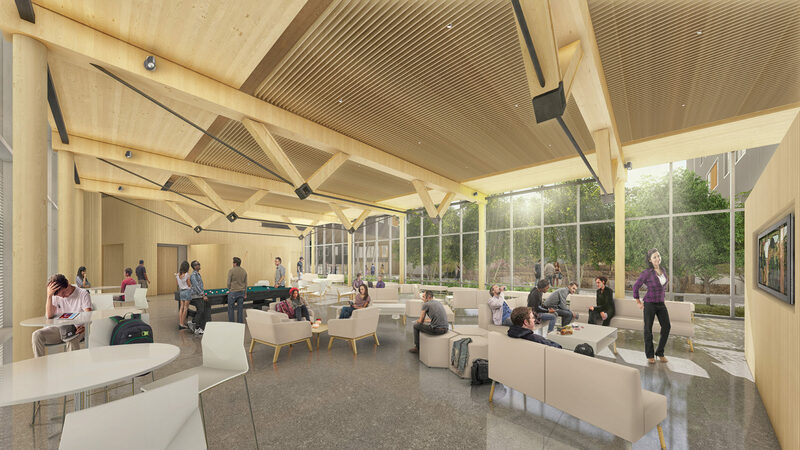 Working off of a “cabin the woods” concept, 708-bed Stadium Drive Residence Halls feature fully exposed, locally harvested wood structural elements. 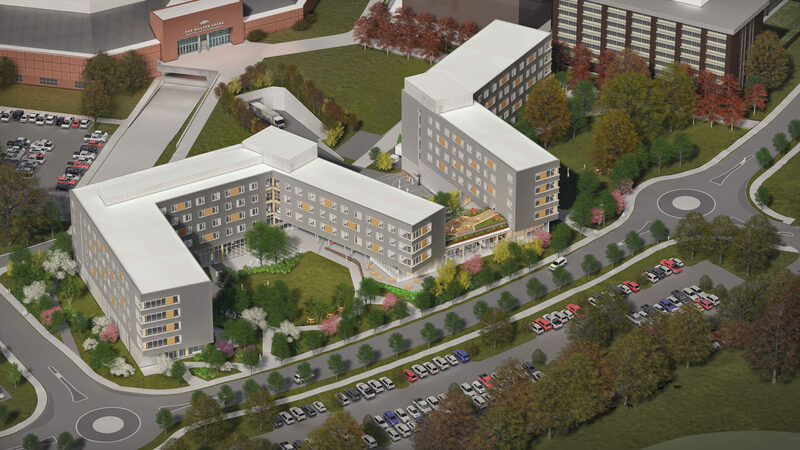 The residence halls are a pair of snaking buildings joined in a central plaza, and include classrooms, dining facilities, maker-spaces, performance spaces, administrative offices, and faculty housing. 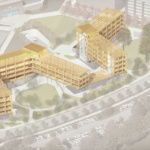 The five-story buildings, totaling 202,027 square feet, are clad in a zinc-colored paneling, while copper-toned panels are scattered along each floor that appear to float above the heavily planted backdrop. 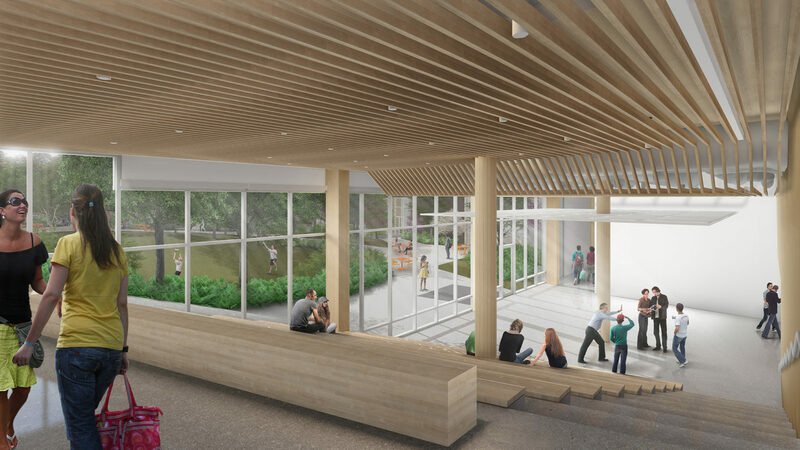 Inside, wooden columns, beams and cross-bracing are all displayed to present a sense of warmth, and to connect students with Arkansas’s local ecology. 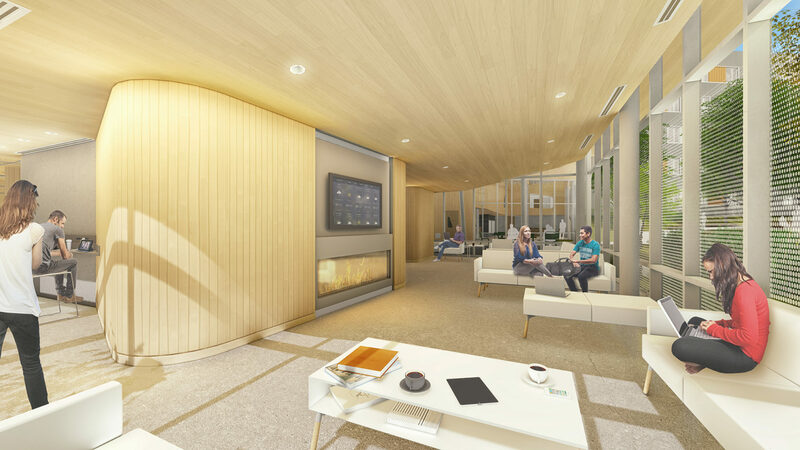 The halls terminate with large study rooms at the end of each floor, which light up at night and act as beacons for the rest of the campus. 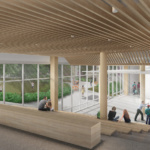 The panels were constructed from Cross Laminated Timber (CLT), while the structural columns and beams are made of glulam, where layers of wood all facing the same direction are laminated together under pressure. 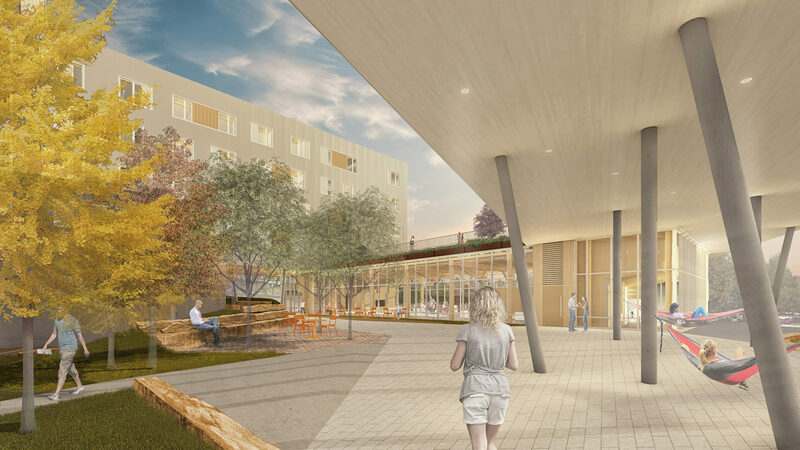 Each arched building curves around a courtyard or common park area and students enter the complex through a covered “front porch” at the northern building’s main entrance. 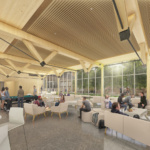 The central gathering room that connects the hall’s two wings has been dubbed the “cabin,” and despite being relatively small, packs in a hearth, community kitchen, lounge spaces, and a planted green roof. 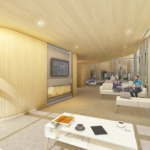 Each hall also features a double-height ground floor lobby with floor-to-ceiling windows that allow uninterrupted views of the surrounding landscape. 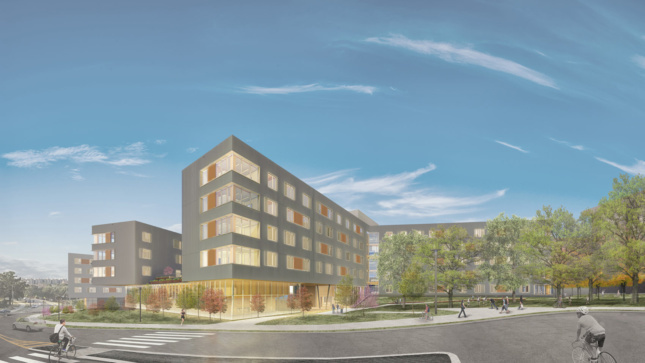 “The interwoven building and landscaped courtyards, terraces, and lawns; the beauty of timber structure and spaces; and the excitement of performing arts and workshop facilities will make this newest campus residential community a destination and a magnet,” said Andrea P. Leers, principal of Leers Weinzapfel Associates. Leers Weinzapfel is no stranger to working with timber, as its multidisciplinary design building for UMass Amherst wrapped up construction late last year. 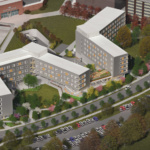 The project is expected to finish in 2019, and will anchor a new master plan for the University of Arkansas campus.